A Real Scrapper: Pauline spends her free time creating scrapbooks. Often onscreen, as in Rain Man or the more recent and even more deplorable I Am Sam, the mentally challenged exist to teach us lessons about kindness and sensitivity. These films don't always stress the taxing side of dealing with someone with a childlike mind--how they can insist on having their own way, how they need constant attention. Pauline and Paulette, an honestly touching piece from Belgium, marries a nostalgic surface to a sometimes wounding study of four sisters, one of them with a mental age of about five. The film is set in the present, but it emphasizes a world that is passing away, exemplified in such images as the florid artificial colors of the silks and satins in the dressmaker sister's shop. Balancing the saturated sweetness is the traditional Flemish fascination with faces so homely that they're beautiful. At the beginning of Lieven Debrauwer's short (78 minute) study, the elderly Pauline (Dora van der Groen) is living a trouble-free life with her unmarried sister Martha in the town of Lochristi. Pauline waters the flowers and makes scrapbooks; she's so simple-minded that she can't tie her shoes or cut her own sandwiches. In her spare time, she loves to visit her sister Paulette, the dressmaker, whom she worships. Paulette's dress store has the outlandish colors of 1950s haute couture and Technicolor musicals; the lady in charge has certainly been thinking pink. Pauline is drawn as if by a magnet to the frills of the store, particularly the rose-patterned gift-wrapping Paulette uses. Pauline's appearances at her store are an annoyance that Paulette endures. The dressmaker sister is old, very stout, and rather sour, and she has an all-consuming hobby: appearing in amateur operettas. The movie is full of froufrou music that matches Paulette's decor: a selection from The Nutcracker Suite, Strauss' "Tish-Tash Polka," and others. Then one morning Martha dies, leaving Pauline without a keeper. The rest of the story concerns the arrival of a sister from Brussels, Cecile (Rosemarie Bergmans), the only one of the four sisters who seems to have found a slight amount of romantic happiness. Her plan to bring Pauline to the city is overruled by her impatient, middle-aged French boyfriend. (Shaved-headed and seriously eyebrowed, actor Idwig Stephane would have once made a nice spy-movie villain.) His dictate leaves Paulette with sole custody of the sometimes mischievous, sometimes unruly Pauline. 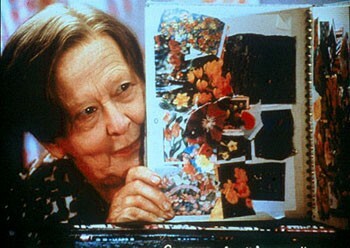 At times, Debrauwer's mood is more effective than the acting. The director is overly charmed by van der Groen. She's described in the press kit as "Belgium's national treasure"--well, no one likes to see wealth flaunted. Whenever the film gets cute, whenever it moves away from almost Fassbinderian moments of examining forlorn, lonely lives, the scene-stealing old lady's to blame. Still, Pauline and Paulette is a fine reverie on the way idealized places pass away and grow more vivid in the memory. In this way, the movie stings you, reawakening thoughts of family snubbed in favor of work or status or simple peace of mind. 'Pauline and Paulette' opens Friday, March 29, at the Rafael Film Center, 1118 Fourth St., San Rafael. For details, see or call 415.454.1222. From the March 28-April 3, 2002 issue of the North Bay Bohemian.